I love this series. Bill Slider is one of my favourite detectives & this entry (number 17) in the long-running series is as good as any of them. Rowland Egerton is an expert on Antiques Galore!, a TV program that sounds very similar to the BBC's Antiques Roadshow. The program visits various locations, experts appraise objects brought along by members of the public who are amazed or horrified by the valuations. Egerton is one of the stars of the show; handsome, debonair, charming. One afternoon, Egerton is found dead in his home, stabbed in the throat. His business partner & friend, John Lavender, who discovered the body, is shocked & distraught. Slider & his bagman, Jim Atherton, are quickly on the scene & realise that this is no random burglary gone wrong. There was no sign of forced entry & only two objects, out of the vast array of antiques on display, are missing. A green malachite Fabergé box & a painting by Berthe Morisot. Neither object was fabulously expensive so there must have been a reason why the killer only stole those two pieces. As Slider's team begins to investigate, Egerton's public persona as the charming expert is dented quite a bit. He'd changed his name, left his wife & daughter & had many affairs. His colleagues also accused him of pinching the most promising objects to feature on the show & of buying the best objects from their flattered, star-struck owners after the show. Egerton & Lavender owned an antiques shop which was mostly bankrolled by Egerton although it was Lavender who had the real knowledge of antiques that propped up Egerton's role as an expert. It soon becomes clear that there were several people with a motive to kill Egerton. Politics, forgery & the television business all have a role to play in solving the murder of Rowland Egerton. Porson went on, "Well, keep me informed. The instant you've got something. And don't go plunging in irregardless, like a bowl in a china shop." "I want all your ducks in a row before I go in to bat. This is a whole new kettle of worms you're opening up." "I know, sir," said Slider. It was never a good sign when Porson's imagery started to fracture. The atmosphere of this book is a little more downbeat, in tune with Bill's worry about Joanna. The wintry weather is also very much in tune with Bill's melancholy & the depressing dead ends of the investigation. I picked up Star Fall when I was reading several big books & needed a change. It's been a while since I read a contemporary detective novel & I read this in just a few days. Bill & his team are reliably entertaining & I'm looking forward to the next Slider mystery, One Under, which is published in November. Porson is my favourite character, I admit. I agree about Slider et al. I just finished _Grave Music_ and will gradually read all in order, if possible. The reference to Joanna is revealing. They got back together at the of the novel. Yes, it's a great series, I've been reading them as they were published & the continuing story of the characters is more involving sometimes than the mystery plot. Many thanks for writing about this series. 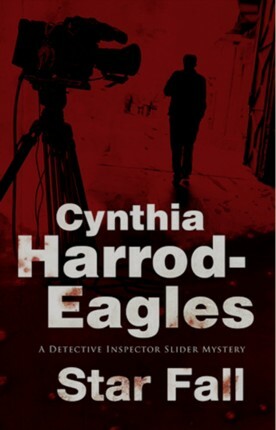 I had read and enjoyed many of Harrod-Eagles historical novels but hadn't realised that she wrote crime too. Must look them up. This series started in the 1980s & I've always enjoyed it. I read the Morland series up to the early 19th century & I remember loving the Kirov trilogy as well as some of CHE's stand-alone novels. Her books are always enjoyable. This series is one of my favorites, too, Lyn. I've read it since the very beginning and in fact, the first book, ORCHESTRATED DEATH is still one my all time favorite first series books. I thought I hadn't read STAR FALL, but once I'd read your review I said, well, of course I've read it. Old lady memory is the pits. I have the same problem with the Jeeves books. I can never remember which ones I've read. I had to make a list so I wouldn't buy another copy of one I'd read or listened to.